A long time ago, my landscaper son was just a little guy and ready to graduate from a crib to a normal bed and I decided to make him a quilt. I was still very new at this quilting thing and went to the fabric store to buy some fabric. His favourite colour was green and so I found some great cotton fabric with fish hooks printed on it and bought a bit of the green and a bit of the cream. The polished cotton was great for cutting out, but not so easy to piece, but I persevered and pieced the twenty 12" blocks one at a time. Because I only had the pattern for the block, not the entire quilt, I didn't have the convenience of someone calculating the correct amount of fabric and I barely had enough to finish the blocks needed. I had hoped to add a border, but the fabric was no longer available and I didn't have a circle of quilting friends to ask if someone else might have what I needed. The quilt was layered with a polyester batting and some unbleached cotton muslin for the back. And, because hand quilting was all I knew, I hand quilted all the blocks. And again, the polished cotton was not my friend! Binding was still a mystery for me and I bought pre-made green bias binding from the fabric store to bind the edges of the quilt. I carefully pinned it and sewed through all layers at once - it did the job, but didn't look very pretty! Now its 25 years later and we used this quilt over the weekend while we were camping at the beach as a beach blanket. The polish is off the cotton, the hand-quilting has held up and the binding hasn't faded a bit! 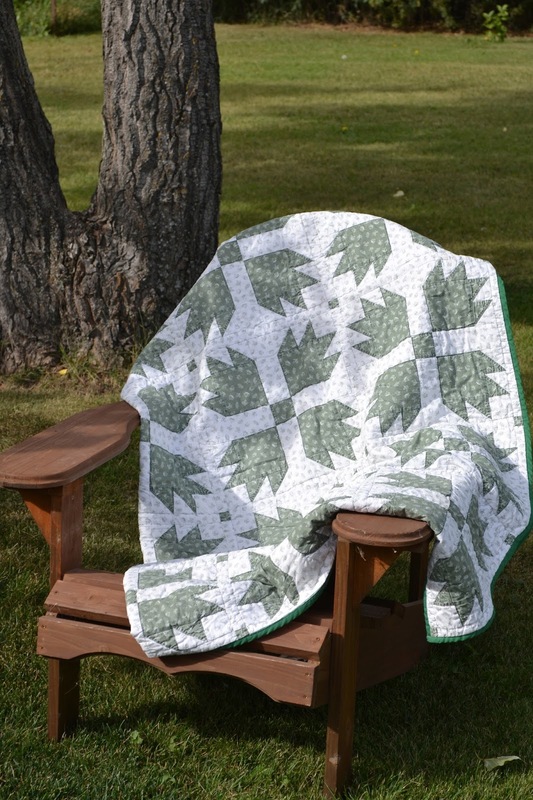 Some of the fabric is worn through, but it just shows that this quilt has been used and loved! Do you have an old quilt with a story? Tell me about it! Great story! My first quilt was a Log Cabin, made 25 years ago, shortly after I built my house. I have no idea where it is, but I still have one leftover block. The second quilt was an Amish style but my mistake was using poly blend fabrics, which frayed. I have it, and hope to repair it one day. I made a log cabin quilt for my oldest son - and it's still around too! Some day I'll write something about it too. What a wonderful story. How exciting that your quilt has stood the test of time!! I don't have an old quilt with a story sadly - I wish I did!! You have beautiful quilts too and they will have their own stories in time!